Farewell, Daughtry — Paolo M. Mottola Jr. WTF?!! 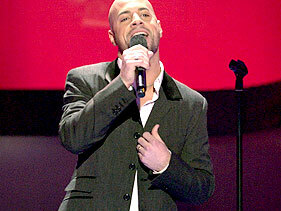 How was Chris Daughtry voted off American Idol last night? "A lot of people predicted both of you could be in our finale... A lot of people predicted, Chris, that you could be the next American Idol," said host Ryan Seacrest at the end of last night's show. Then, without his characteristic tension-building delay, Seacrest dropped the bomb: "Chris, you are going home tonight. The journey ends. America, you have spoken and Chris is leaving the show tonight..."
Both Daughtry and competitor Katharine McPhee were visibly shocked by the announcement. McPhee, the last remaining piece of American Idol eye candy, joins Taylor "Wedding Singer" Hicks and Elliott "I'm the Larry Bird of vocalists" Yamin in the semi-finals. Most of my friends know that my reason to get up on Tuesday mornings is to watch American Idol. I'm not the only one stunned by last night's results. At work today, a humbling, post-defeat vibe permeates the office. "I'm in denial," said my co-worker Karla. "I've been watching American Idol all five seasons and I've always been happy with the end results. I don't know if I can watch it now." Karla, overcome with emotion couldn't continue to talk about last night's results. "You're talking to a person in mourning."